What is Indian Golden Triangle? 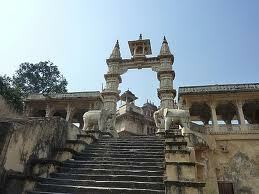 Govind Dev Ji temple is located within the City Palace complex. 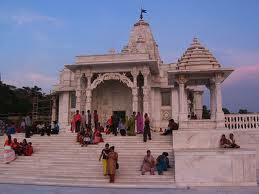 The temple is dedicated to Lord Krishna. Raja Sawai Jai Singh II brought the image of the main deity from Vrindavan. According to a popular legend, Lord Krishna s image in the temple reflects the exact form of Lord Krishna s during his incarnation on Earth. Lord Govind Dev Ji is considered as the Thakur of Jaipur. The image of the main deity belonged to Srila Rupa Goswami, a disciple of Lord Chaitanya Mahaprabhu. After Vrindavan, Govind Dev Ji temple is the most revered place of worship for Vaishnavites, in specific to the followers of Lord Krishna. 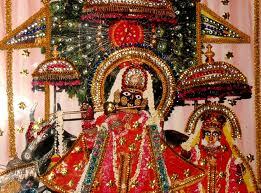 The main deity is unveiled for Darshan or viewing seven times a day after elaborate rituals of offering Aartis and Bhog . Janmashtami, birthday of Lord Krishna is celebrated with great pomp and show with thousands of devotees visiting the temple. As per a legend while the Pink City was being made, the founder of the city King Sawai Jai Singh lived in Suraj Mahal, situated between Chandra Mahal & Badal Mahal of the City Palace premises in Jai Niwas Gardens. On a night he dreamt that 'this place was meant for the Divinity and he should leave it'. Submitting to the message received in his dream he left the Suraj Mahal and shifted to Chandra Mahal. Suraj Mahal was blessed to enshrine the Holy Images and became the Govind Dev Ji temple and a great place of worship at Jaipur. It was built in 1890, the Govind Devji Temple, Jaipur is dedicated to Lord Krishna. It attracts devotes of Lord Krishna not only from all the corners of India but of the world as well. The seven-storied structure was built in the form of Greek cross at an enormous cost of one crore rupees. Located in the City Palace complex this place is a must go for the visitors. The temple room is quite huge and airy. The finely carved floral patterns on the walls, washed in what else but pink with sunrays filtering in from small dents in the roof was accentuating the fascinating beauty of the temple. Get best deals, offers and discounts on Indian Golden Triangle travel packages. Here you will get latest information Golden Triangle of India (Delhi, Agra, Jaipur) with luxury, budget, deluxe, cheap and most affordable travel packages.